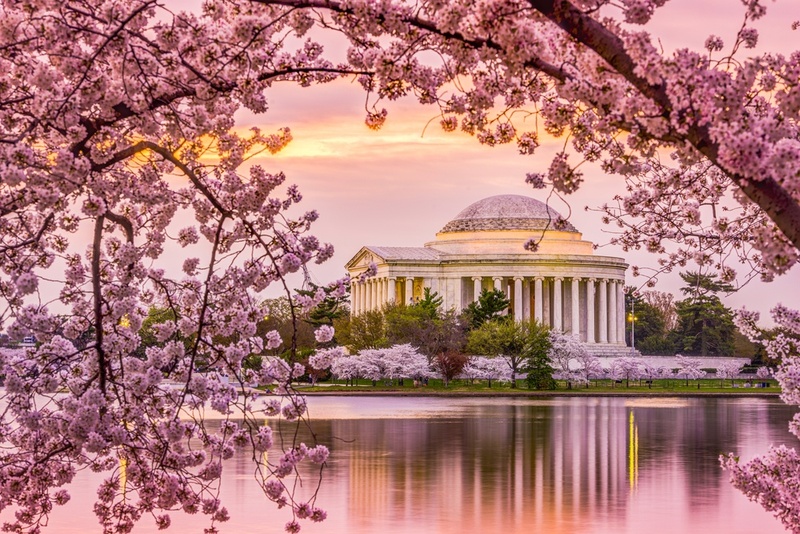 Every year, visitors from around the world travel to the District of Columbia to witness a transformation—the annual blooming of the cherry blossoms. Gifted to the City by Mayor Yukio Ozaki of Tokyo in March 1912, the more than 3,000 cherry trees bring an explosion of life to the City and are celebrated with a series of events and celebrations each spring. The DC Circulator’s National Mall route provides direct access to the blossoms at the Tidal Basin. Hop off at stops 6, 7 or 8 to tour the blooms, or continue on the route for unparalleled access to the National Mall’s Smithsonian museums. The nearest Capital Bikeshare stations to the Tidal Basin are Jefferson Dr & 14th St SW and 17th St & Independence Ave. SW. Capital Bikeshare rides start at just $2. Download the Capital Bikeshare app for current bike and station availability. Take in the view from the river with the DC Water Taxi! Board at Georgetown’s Washington Harbor or at the Tidal Basin. Tickets are available at dc-watertaxi.com. To access the Tidal Basin by Metrorail, take the Orange, Blue or Silver Lines to Smithsonian Metro station or L’Enfant Metro station. Yellow and Green Lines can also be used to reach L’Enfant Plaza Metro station. The ANA airlines Performance Stage will host a series of daily performances throughout the festival from noon to 6:00 pm. Take the Orange, Blue or Silver Line to Smithsonian Metro station, or take the DC Circulator's National Mall route and disembark on 15th St. NW by the Washington Monument. The nearest Capital Bikeshare stations are located on the National Mall near the Washington Monument at Jefferson Dr & 14th St SW and 17th St & Independence Ave SW. The opening ceremony will take place on Saturday, March 24, from 5:00 pm to 6:30 pm, at the Warner Theatre. To get there, take Metrorail’s Red, Orange, Silver or Blue Line to Metro Center. 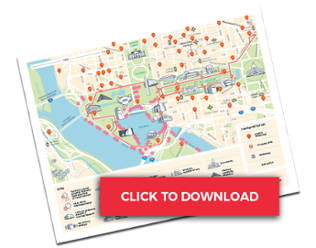 The nearest Capital Bikeshare stations to the theatre are 14th & D St NW/Ronald Reagan Building and 10th & E St NW. Take the DC Circulator's National Mall route to disembark on Constitution Ave NW and then walk a short distance to the Warner Theatre. Anyone can participate in the Blossom Kite Festival! Just bring your kite to the grounds of the Washington Monument on March 31 from 10 am to 4:30 pm. The Blossom Kite Festival is accessible by Metrorail’s Orange, Blue and Silver Lines, the Smithsonian Metro station is closest to the event. DC Circulator’s National Mall route services the entire Mall, with direct stops along 15th St NW. Capital Bikeshare stations are also located on the National Mall near the Washington Monument at Jefferson Dr & 14th St SW and 17th S. & Independence Ave SW. Marching bands and performers from across the country will participate in the iconic, one-mile annual National Cherry Blossom Festival Parade on April 14 from 10:00 am to noon. To stand on the north side of Constitution Ave, take Green or Yellow lines to Archives-Navy Memorial-Penn Quarter Metro Station or Blue, Orange, Red or Silver lines to Metro Center. To stand on the south side, take the Blue, Green, Orange, Silver, or Yellow line to L’Enfant Plaza, or Blue or Orange line to Smithsonian Metro. DC Circulator's National Mall route also serves the parade route via the stop at Madison St. NW. There are several Capital Bikeshare stations within walking distance of the parade route. *Ticketed attendees should consult their tickets for directions to their assigned seats. The inaugural Petalpalooza will make its debut on April 7th at The Wharf from 1:00 pm to 9:30 pm, including a fireworks display (weather permitting) that will take place at 8:30 pm. The Southwest Waterfront can be accessed by Metro’s Orange and Blue Lines to L’Enfant Plaza Metro or the Green Line to Waterfront Metro station. Taking Capital Bikeshare? There are three stations nearby: Maine Ave & 9th St SW, Maine Ave & 7th St SW, and 4th & M St SW (Waterfront Metro). Go for a spin on Capital Bikeshare! The shiny red bikes are a DC-area icon and there are stations located throughout the city and along the National Mall. Use Bikeshare to shorten the distance between Metrorail and festival events. Visit CapitalBikeshare.com for day or weekend memberships and download the app for real-time bike and dock availability. You can use your SmarTrip® card on the DC Circulator, Metrorail and regional local bus services. Use the transit function on your phone’s navigation app or download Citymapper for real time arrivals and trip length.